These Grand Opening Flags are Priced to Sell! Advertising Pennants are Great forms of Marketing! 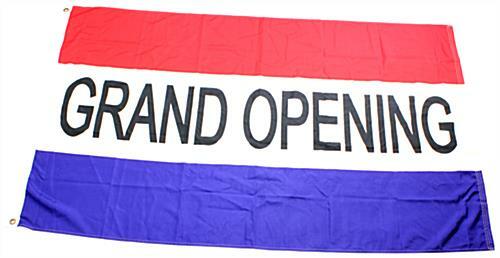 Grand Opening Flags Ship Fast when In Stock! Bold black message to attract customers into a new business. We finance pennant features (2) brass grommets for attaching to a flagpole [not included]. 100% Nylon for outdoor use. 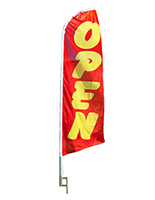 These grand opening flags are ideal for promoting a new retail establishment. 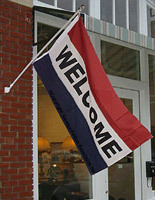 Hang this message banner outside the front door on the first day of business to bring in potential customers. A retail establishment is not the only place to find these grand opening flags. Dentists, salons, spas, day cares and food venues are also among the many users. 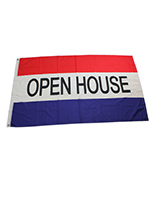 These advertising pennants are grand opening flags that are compatible with flagpoles [sold separately]. Each banner is designed with two brass grommets. Instead of attaching the grommets directly to the nylon grand opening flags, there is a strip of white canvas over the nylon where the grommets are placed. The canvas protects any potential tearing of the nylon around the eyelets. The grand openings flags fit on the flagpoles quickly and easily with the brass rings. All sides of the advertising banner have reinforced hem for long lasting use. These grand opening flags are a great size for viewing from a distance. Each message pennant has text screen printed onto the fabric in a black bold font. The words on these grand opening flags that work outdoors is reversed on one side due to the screen printing method. Similar advertising banners on the market are designed with vinyl applied lettering, which overtime will look worn or being to peel off the nylon. 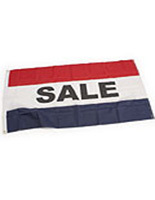 These promotional pennants are grand opening flags that are priced to sell to work with any sized budget. The simple red, white and blue design of this advertising banner is a highly effective marketing tool for new business ventures. We are unable to accept orders for less than 3 units.